A side-scrolling role-playing game, in which you play as Nash, who's trying to thwart the schemes of a group of evil mages. The gameplay of Magic Scroll Tactics involves exploring locations and fighting enemies in turn-based combat. Magic Scroll Tactics is a role-playing game by indie developer Otori Denshi. What makes the game distinct among other productions of the genre is the perspective it utilizes and unique combat mechanics. Magic Scroll Tactics is set in a fantasy land, threatened by evil mages, planning to bring back a vastly powerful witch from the dead. During the game, you play as Nash, who decided to thwart their schemes. The protagonist is later accompanied by other characters, including a noble-born priestess. Magic Scroll Tactics utilizes a side view; you explore locations and fight various enemies. The combat is turn-based and set on maps divided into square fields. What matters in combat are not only your characters' abilities and equipment but also their positions. The higher your position, the more damage you can do. The characters have different classes (which can be changed if necessary), which affects their weapons and special abilities. As the game progresses, they earn experience points and level up, which allows you to unlock new abilities or upgrade ones they already have. 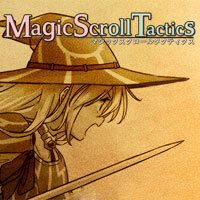 Magic Scroll Tactics features colorful 2D visuals done in manga style, and a clear interface.